Appreciating Copenhagen’s many highlights can be difficult on a self-led tour. 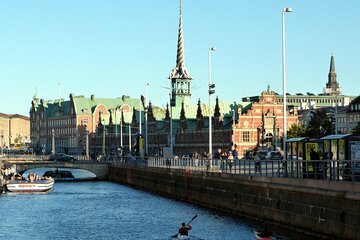 Explore the city by foot, canal boat, and bicycle for intimate insight into its culture and heritage on a small-group tour, and discover attractions including the Little Mermaid statue, Danish Royal Palace, and Strøget. Learn about the city’s history from your guide, and benefit from the small-group size for a more personalized experience. There could no more be way of discovering Copenhagen in a short stay except thru this. Tour guide Michael was superb!! This tour was great. We were a total of 5 people in our group. Laura was our tour guide. She was great. She was very knowledgeable and very personable. The pace was not too fast. We walked and stopped for 3 hours. Took a boat ride through the canals for one hour. The boat ride had a tour guide, but Laura sat with us and pointed out things along the way and gave additional comments. Then we rode bikes for 3 hours with stops along the way. All of it was done at a normal pace, not too fast. After the tour was over, she walked with us to a get a hot dog at a certain food stand (this is a must, it is organic! delicious too! ), then took us to some shops we had asked about. She offered to stay with us longer but we were exhausted. I would highly recommend this tour to anyone that wants to touch on the high points of Copenhagen. We were only in town for 1 1/2 days and this was perfect for us. We got to see most of the highlights. We did not get to go inside of everything, but there is so much to see. Great tour! So many sights that we saw in Copenhagen, caught just about all of the highlights and had a great guide that was able to explain everything. A great way to start a trip to Copenhagen. The tour takes in most of the city sights and starts with a couple of hours walking round the central area which gets you orientated and then progresses to the canal tour which covers the waterfront etc. Finally there is the bike ride which is probably the best way to cover ground and explore further. The tour was very well organised and delivered by our charming guide Sjalla who couldn't have been more helpful pointing out lots of interesting places and facts as well as answering all our questions and managing any necessary stops. Recommendation of taking lunch in the Food Market was particularly helpful and we even went back there after the tour to further explore its delights. Sjalla made the day and her infectious personality and smile kept the notoriously fickle Copenhagen weather sunny despite the forecast. My wife had her doubts about being able to participate in the cycling part but Sjalla couldn't have been more helpful, patient and encouraging and soon dispelled any nervousness. Although billed as a small group tour there was only the two of us which made it even more personalised. Thoroughly recommend this tour. Our Guide was excellent. We had a long walking tour of the city. Then a great canal boat trip. Followed by a bike ride out to see the Little Mermaid. The bike ride was at the end of the day so the traffic was busy. Not for the faint of heart! We had a great tour and our guide was very knowledgeable the City and the sites. I forget her name but she was from Spain. The two things I would change was more bathroom breaks. She seemed to know where all the public bathrooms where once we finally asked 4 hours into our tour. And riding a bike in commute traffic with no bike lane was not safe for me. She was used to it, I was not. I ended up pushing my bike on the side walk part of the time. She needed to read the 8 people on the tour a little better. We saw a lot and great time was had by all. But bicycling in traffic if you are not use to it can be scary. I did love the Tovehallerne food hall for lunch, but was so turned around it could not find it again when we came back from our cruise 9 days later. Some kind of map of where all we went might have been helpful, we kind of walked and biked in big figure 8 and I just lost my sense of direction. I didn't m know the name of the place until I read someone else's review. Couldn't recommend this tour more. As recommended in other reviews, we took this tour our first day in Copenhagen. So glad we did. Laura was a terrific guide with all kinds of interesting info, and it gave us an overview for this rest of our stay. I visited Copenhagen for work from USA-Michigan and was traveling solo. This was the highlight of my trip. There were 4 other solo travelers in our group of 6. Our guide was fabulous and was always very conscious of our safety bike ride. I met some fabulous people in group. We even went out to dinner together afterwards. Amazing place to visit and a great tour to be part of. This tour was absolutely fantastic! I've been on my fair share of guided tours all over the globe and our guide, Laura, was without a doubt the best guide I've ever had! Not only was she knowledgeable and provided us with all sorts of fun facts about the city, but she was also hilarious, had fabulous food recommendations and made modifications to the tour based on our group's interests. Highly recommend -- this tour will not disappoint!